Stephanie Harrison-Croft and Liz Kirtley from Hope 4 Pets and Sybel from Petcross having a nice chat with the very charming Can Gazi on TRNC television programme A Cup of Conversation. 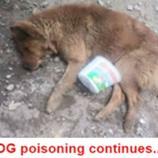 We would like your comments if you are a resident or tourist, regarding first hand experience of poisoning of your pets or seeing poisoned animals during walks or near your homes, or holiday accommodation, we intend to gather as much information as possible regarding the scale and scope of poisoning in the TRNC and hand it to the authorities so they can no longer ignore this very serious threat to our pets and street animals. Your support would be much appreciated, simply e- mail us at info@hope4petsnorthcyprus or contact us via face book. Please state if you are a resident or tourist when posting any information, no other details regarding your identity is necessary, unless you want to give it.